Superman saves a schoolbus, visits a hospital full of kids, and then sets about writing his last will and testament using a Kryptonian mind reading device. Quintum meets with Superman, and goes to entreat Kandor with an idea. 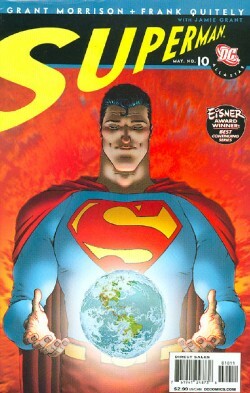 Superman, in the meanwhile, crafts a square Earth he calls Earth-Q to see if humanity can survive without him. Superman finds a time capsule from the future buried in the past, then saves Lois from a giant robot with a man in it looking for Lex Luthor (the man has Alzheimer's). Lois tells Superman she knows he's dying, and they attempt to reassure each other. Superman saves a suicidal girl. In Kandor, a group of Kandorians step forward to save Superman's life. Superman returns the bridges that he used to sew the moon back together. As he does, Earth-Q develops in the background. Superman visits Lex, and tells Lex that in the three weeks before he's executed, he should do something to save humanity, and that he's won. Lex spits on the glass. Superman hears from the time capsule a man from the future who speaks almost entirely in leet speak, telling him to go to Solar Intelligence Systems, wanting to save Superman for saving his ancestor and being responsible for his existence. Superman and Quintum release Kandor on Mars. On Earth-Q, Nietzsche coins "Superman," and in Cleveland, an artist sketches the first modern Superman. Superman leaves the secret to combining human and Kryptonian DNA to Quintum, the future to Lois, and he leaves Clark Kent an article that says that Superman is Dead from the future. Story - 5: Arbitrary continual lateness complaint: Here. This story, however, was incredible. Superman on an average day, where he creates our world, saves Kandor, heals cancer patients, stops a gal from committing suicide, fights a giant robot. Heck, they even RETURNED THE BRIDGES. Remember me complaining about that? That's how tight this is. Camelot Falls had a scene where Superman decides he should keep on being Superman because he saves one little girl, after learning that he'd be destroying the Earth, etc. I didn't think it a significant argument. Had that issue instead shown what Superman does here, it would have earned my sympathy. Here's a dying Superman who knows that his future is predestined, still fighting on without even questioning himself once. It's such pure Superman, it's not even funny. Even when Lex spits in his face (and fine Lex, at that), he still believes the best. The only arrogance here is that Superman essentially becomes God in this issue, and has the gall to start up his own universe. But if you read the stories from the era this story is derived from, he does things to that nature all the time. Starting universes, curing cancer, digging up old shipwrecks, etc. Easily the best homage ever to Superman. The best Superman story? No, because it's not deigning to climb down into the ongoing. But the best homage? Easily. Art - 5: Quitely continues to be amazing here. Kandor on Mars alone is a poster. The face on the man in the robot. Lex spitting. The men flying out of Clark's hand. There are absolutely BRILLIANT and iconic panels here. This is some of the finest work I've ever seen. Quitely REALLY grows on you. Cover Art - 5: Representative of the issue, a good post, amazing coloring, a fine piece.